Subtitle: Magic always comes with one. Witness my desperate attempt to stay current by posting this hours (minutes…) before the new ep (that I was lucky enough to see Friday night at NYCC, shout out to the Once Upon a Time Dance Party!). In my defense I spent the past week writing a paper on how brain science suggests teens are wired to enjoy The Hunger Games/dystopian fiction (shout out to anyone studying neuroscience, it’s seriously hard) and getting ready for NYCC at the same time. Anyways, enough about me, this ep is generally strong if maybe a bit disjointed. We start, as we so often do, with the dwarfs at the town line. At the NYCC panel Adam & Eddy confirmed that the callbacks and cyclical nature of Yet Another curse and Yet Another bout of amnesia, and thus at least in theory Yet Another scene with the dwarfs at the town line, is entirely intentional and will be addressed at some point (so keep watching! Live! Sundays at 8pm! /contractual obligation). Which falls in line with my own ‘stories are circular’ commentary so Yay! 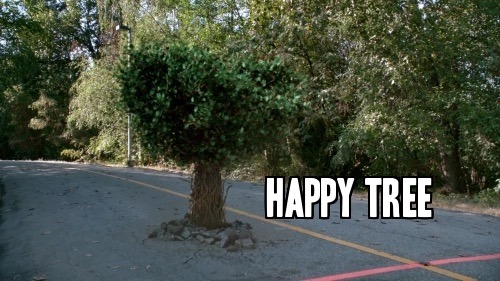 And turns into a tree. Something Regina’s never seen before cuz she’s a wizard not a druid (Emma’s a sorcerer, Snow & Robin are rangers, Charming’s a paladin, Belle and Henry are bards, I’m a nerd). trapped in a tree. But! 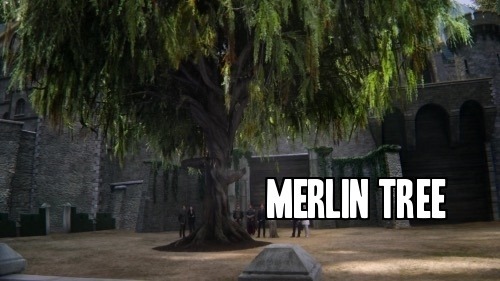 Prophecy says The Savior will release Merlin. The Arthurians turn expectantly to the Storybrookers, who look shiftily around cuz their Savior aka Emma is also aka The Dark One and using Dark Magic is a no-no for Reasons (it will turn Emma Dark I guess? The secrets/rules/concepts of the Dark One’s Darkness wrt to Emma are pretty fuzzy which is a big part of why they are all so shifty in the first place. The smaller part of why is there is no other town so full of shifty people lbr). Emma looks to step up and admit to being the Savior despite the trap of turning Dark in her attempt to free Merlin so he can make her Not Dark but Regina, Emma-controlling-dagger in hand, beats her to it. And she proceeds to play the part in both continuities for the remainder of the episode. In Camelot Regina is treated with respect and a bit of awe and it rattles her confidence. She even considers opting out of the welcoming ball – she says it’s because she can’t dance but as I cannot believe for one hot second that Cora, the woman who named her baby daughter ‘queen’ because she was so hells bent on it becoming reality would not teach said daughter courtly dance, I think Regina was a) afraid to go because b) she’s not used to people treating her wit respect because they actually respect her and not because they’re afraid of her and also c) it’s really the Savior they respect not HER which is pretty much the same thing as being afraid of the Evil Queen. 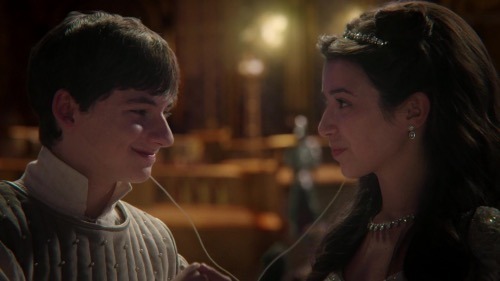 Also also d) she just wanted to dance with Charming. But she does go the ball, and she’s treated with respect and awe, and in Robin’s case love… right up until she’s recognized as the Evil Queen who murdered and maraudered and ruined Percival’s childhood so he intends to kill her. Robin gets in between the blade and his lady and ends up bleeding out. And Charming stabs Percival. To death. Which. Wow? I mean, look, y’all know I love Regina and absolutely think she’s redeemed/redeeming herself but in actual fact Percival had a legit grudge and maybe doesn’t deserve to die for it? Idk, it’s very Charming to rush in, especially if he assumed a confrontation with Regina would bring all their half truths to light, so I’m not upset, but maybe surprised? That only Guinevere thinks it’s a bit distressing that a knight of the round table is dead over this. Anyways, Robin is mortally wounded and Regina’s magic can’t save him because the magic enchantment on the blade was intended to kill her (oooooookay). So she turns to Emma and asks (begs) her to save Robin at the cost of using Dark Magic. 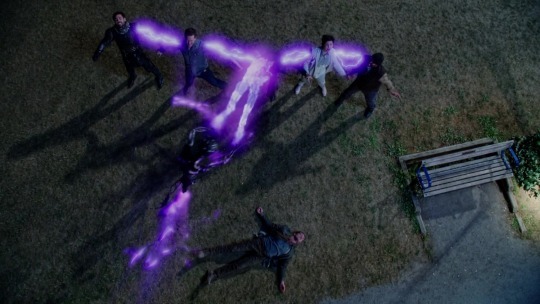 Emma does, Robin is saved, and since she’s started using the Dark anyway, Emma then heads to the tree and sets Merlin free so he can fix her and they all return to Storybrooke intact and free from Dark Magic forever. No, of course not, that would make sense. Arthur takes Robin’s recovery as proof that Regina is for sure the Savior of legend and prophecy and apologizes that his knight – who is now DEAD by the hand of King David – attacked her. Regina smiles demurely, Emma looks shifty, I wish Anna was around to yell at them all to stop being so … THEM. In Storybrooke, Regina is treated with no awe and little respect and it also rattles her confidence. Basically Regina has a lot of issues with confidence (which is different from arrogance, mind you, which she has in spades) no matter how she is treated. Robin and Henry try to prop her up and Emma taunts her cuz that’s what Dark Magic does – turns you into a manipulative jerk. Tbqh, I really like that Dark Swan uses Dark Rumple’s tricks and I’m now very interested to see how Newly Not Dark Rumple behaves. Then the Charmings, Leroy, and Arthur run in to join her and the Fury + all the forces of Hell are repelled. Robin is saved again. Belle does stuff! She bonds with Hook over loving a Dark One, which is GREAT, cuz I think they have a cool vibe. She dances with Leroy which is darling. And she helps Regina figure out what the Fury is and why it’s there. Belle is best at research forever. Emma terrorizes her son, and invites Hook to her new house (one bunk free at the Charmings! I vote Ruby takes it) where he attempts to free her from Dark Magic with the power of True Love’s Kiss. Truly the most adorable doomed romance ever. And this week in Hmmmmmmmmm: Arthur and Emma have the same goal to reunite Excalibur and the Dark One’s Dagger. 7:33pm EST. I did it!